After a slightly unproductive day searching for insects, I wasn't expecting to find any, really thinking it must be still too cold. However, late in the afternoon at Arne Nature Reserve, I spotted this little beetle struggling on his back, as beetles often do. 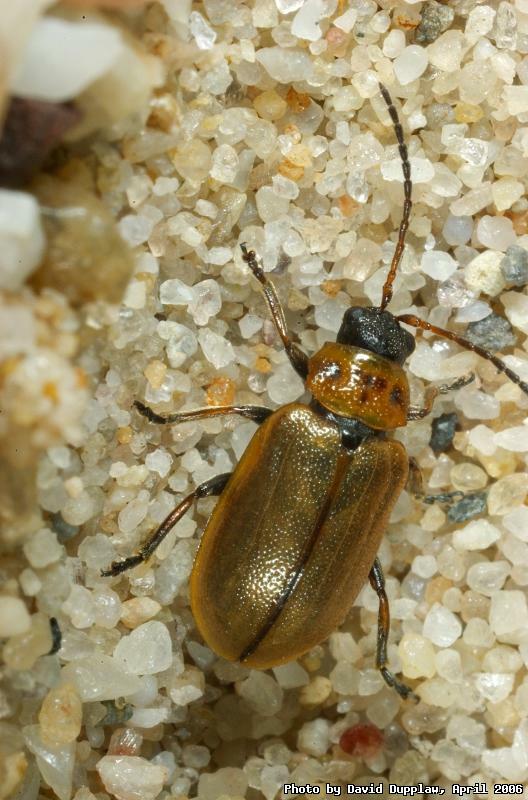 It's a Willow Leaf Beetle (Lochmaea caprea), part of the Leaf Beetle family, that had obviously fallen from trees near the beach onto the sand. They also feed on Birch trees, of which there were quite a few around the beach area. When you see the size of the sand grains (and this was quite fine sand) you can understand how it was so hard for the little fellow to climb out of the small indentation. I subsequentally saw lots of them, all along the beach, and all on their backs. It's hard luck if you end up a beetle on this world!